Clinical management should always include discussion with the patient and/or family about relevant acute or chronic stressors, the nature of the depression, its course, treatment options and likelihood of response to treatment. Reassurance as to the probable effectiveness of treatment is important in combating the feelings of hopelessness and in maintaining treatment adherence. Some psychological techniques, such as structured problem solving or stress management, may be undertaken in the primary care setting. Summary algorithms for the general management of mild, moderate and severe depression based on the PHQ-9 score are available in Appendices 1–4. Everyone with depression requires active management which involves lifestyle review, identification of stressors, support strategies and how to achieve change. The stepped care model involves starting with low intensity therapy (e.g. guided self help, exercise), monitoring response and moving to more intensive treatment (e.g. structured psychological therapy, antidepressants) only if the problem persists. Support and encouragement during guided self help and repeated clinical assessment are important features of this approach. The choice of initial therapy depends on the severity of the disorder, the person’s needs and preferences, service availability and access. The management and screening for depression ideally involves an interdisciplinary approach including input from general practitioners, nursing staff and a wide range of other health care professionals. There are numerous situations and opportunities for health care professionals to act as the first point of contact by identifying those with problems and referring on for further advice if necessary. Treatment for depression is influenced by an individual’s values, preferences, lifestyle, and cultural perspectives. Successful management requires active patient choice between treatment options. No one can be expected to be an expert on every culture, the basic approach is to pause, ask and act. The needs and perceptions of people of different ethnicity, race and sexual orientation should be considered. Simply recognising that people from different cultures might perceive and deal with mental health problems in different ways is an important first step. Practitioners should consider consulting appropriate persons to assist cultural understanding. Language and comprehension differences can also pose challenges. The stigma associated with depression has been significantly reduced in recent years but this may still be a major barrier in some groups, particularly among recent immigrants from countries where mental illness may be perceived as a personal failing rather than an illness. Successful management of depression depends largely on enabling the patient to be an active participant in the care process. A collaborative partnership between practitioner and patient is a consistent predictor of therapy outcomes for both pharmacological and psychological treatments. Active support also involves identifying any problems and either taking steps to resolve them or finding coping strategies. For example, in cases of workplace stress, support may be provided by an employee assistance program (EAP) to identify and resolve workplace issues that may be adversely affecting a person’s mental health. Liaison between the general practitioner or practice nurse and an EAP might be required. Relationship counseling, moral or religious support are other avenues of support that may be considered. Self-management includes exercise, activities (involving family/whānau and friends), advice on sleep hygiene, e-therapy (see below), improving lifestyle and diet and avoiding alcohol and recreational drugs. Patients can be encouraged to keep a diary to aid in self monitoring and reviewing the effects of any lifestyle changes. Māori, Pacific people and other groups may include other approaches such as prayer and traditional healing. Guided self-help refers to the provision of psychological therapy in the form of written materials, booklets or electronic based resources. IT based materials have become known as e-therapy. This refers to a range of techniques using internet communication technology to facilitate counselling, support and self motivated management of life issues that are impacting on mental health. In the past it has been referred to as on-line counselling or coaching, but these do not cover the range of techniques now being used which include: email, real time chat and video, on-line conferencing, video games and interactive tools. It can be used in conjunction with traditional psychotherapy or a lifestyle management tool. E-therapy can also be used in combination with antidepressant treatment and to help prevent relapse of depressive symptoms once they have resolved. There are encouraging signs that web-based self management interventions may be useful in treating depressive symptoms in primary care patients. However, there are literally hundreds of resources that can be retrieved by a search on the internet and most of these have not been validated and may be of dubious quality. It is preferable to direct patients to reputable sites (see e-therapy resources below). CBT is an active, structured intervention in which the patient and therapist work collaboratively to identify the effects of thoughts, beliefs and interpretations on current problem areas, and develop the patient’s skills to identify, monitor and counteract problem thoughts, beliefs and interpretations. The patient learns a repertoire of appropriate coping skills. PST is a structured intervention focusing on identifying specific problem areas and working collaboratively to prioritise problems, break them down into specific manageable tasks, choose solutions and develop appropriate coping behaviours. PST can be readily learnt by a member of the primary care team and can be delivered in short sessions within a feasible time frame. IPT is a structured intervention that focuses on interpersonal and relationship issues. Therapist and patient work collaboratively to identify the effects of key problem areas associated with interpersonal conflicts, role transitions, grief and loss, and social skills. Symptoms reduce when strategies are developed to cope with or resolve these problem areas. Brief structured psychological interventions can be effective for the common mental disorders presenting in primary care. They can be provided by primary care practitioners with appropriate training. A structured psychological intervention is a treatment option for all patients with moderate depression and as combination therapy with antidepressants in patients with severe depression. For moderate depression a psychological intervention could consist of 6–8 sessions of Cognitive Behaviour Therapy (CBT), Interpersonal Therapy (IPT), or structured Problem Solving Therapy (PST) over 10–12 weeks. Most primary care practitioners already draw on elements of these in much briefer interventions in their routine clinical practice. Full courses of specific treatment should be provided by suitably trained practitioners. For a patient with more severe depression, a longer structured psychological intervention (e.g. 16–20 sessions of CBT or IPT) is an appropriate first-line treatment if this is available. In severe depression, a combination of antidepressant treatment and structured psychological intervention should be considered as the combination is more effective than either treatment used alone. 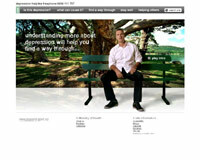 The National Depression Initiative has a recently updated interactive website which has a focus on self management. It provides a self test and detailed information about depression and NZ options for management and treatment in the form of a “journey” that users can take to “get through” depression. It features video clips of New Zealanders who talk about their experience and what they found helpful. The RID trial (2006-2010) will test whether a set of web-based self-help programmes work for reducing depression in New Zealand. The programmes are designed to help people manage their depression by providing relevant information and/or working through a number of exercises on the internet. The aim of this site is to explain the RID trial and invite people to take part in it. Moodgym is based on Cognitive Behaviour Therapy and Interpersonal Therapy. It may be useful in reducing depressive symptoms and dysfunctional thoughts. Gives access to a group of websites which includes information and courses that can be used by primary care clinicians and their patients, by school teachers and their students, and by health science educators and their staff members. They are a not-for-profit initiative of the Clinical Research Unit for Anxiety and Depression at St Vincent’s Hospital, Sydney, Australia. Registration and payment is required to access the course modules.